I enabled 10bit field in crexpo structure instead 8bit one (so it should work with 1024, not 256 types), changed some checks for <256 monster type and something more, and it works - mostly. it spoils stack experience data for monster type >255 after battle which was hard for me to fix. please help me to spot offending code. (I guess reading crexpo.cpp and monster.cpp from wog source would help, but i didn't spot what to search). By having an empty ers file in the mod is not working. It will screw up the wogfication options. Edited by Salamandre at 14:37, 16 Jul 2017. I am not sure I understand. You say you don't want them to run but you also say that deleting their content will screw the wogification process. So if they are necessary, you can't have them disabled. But I am not knowledgeable with ers files, try russian forums. How would I go about playing multiplayer online with a friend on Era 2? Like, from computer to computer? I am using ERA2.46 + HD4.208 on win10 x64. Apparently the new ERA2 dosen't like the latest HD-MOD and i have to copy some libraries from the ERA2 installer and download a downgraded HD-MOD. With the newer HD-MOD the game only crashes for me in couple of seconds. Well, when you guys repeatedly warned that newer HD mod releases provoked crashes, I disabled my HD automatic update. Have no crash, never. There is nothing and nothing will ever be in newer HD versions, for me at least, worth getting an unstable Era. Edited by szaman at 23:21, 03 Aug 2017. I can provide all HD folders I have, but I don't know which files it has placed in game's root folder. If one can give me a correct list of files being installed, I will upload. Basically i need only one file the "patcher_x86.dll" file it's too NEW for ERA 2 and i need the downgraded one that you probably have. Edited by szaman at 00:13, 04 Aug 2017. -Open ERA2 Installer with with a Zip program. I the main problem is that "pather" file... The new ERA2 and new HD uses also this file and one rewrites the other one and vice versa. I can only hope that some day, there will be a update that will remove this file from ERA2, or, change the name so it will not collied with HD-MOD. 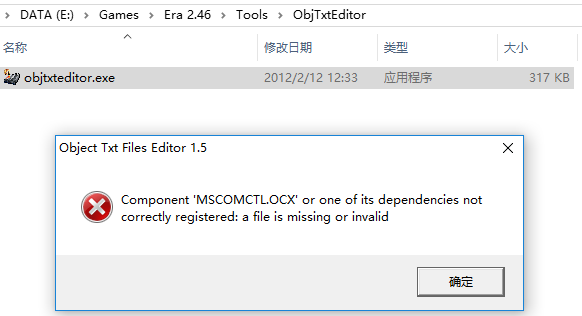 the object editor doesnt run even when i reinstall era2. It was working when I was using win7 x64. I guess it has something to do with win10. Edited by futerix at 16:45, 04 Aug 2017.
it's working fine on my rig, Thinkpat T440, win 10 pro X64, latest updates. from the error you got you have a missing dll register. Puppet_Master, may Typhon, the tool for modding creature, be adapted for a "standard" SoD ? I know then you won't be able to add creatures at will but just to change the ones who still exist it shall be very nice. Its reaallly some excellent tool ! I'm just beginning to hex edit and its very long and hard to do. One time the datas opened, with the work of others to find where some things are written, its more easy but still very long and some mistakes may be done in modding. Here I noticed the program "extract" values in a big table and this big table is used when the game starts I think ? Replacing the original values in game... That's smart and efficient ! If you have no time to answer, I already thank you for your work & sorry if I misunderstand some compatibiliy problems. Edited by Salamandre at 11:48, 05 Aug 2017. Last HD version 100% working with Era (on win7 at least) is 4.206 RC2. Puppet_Master, may Typhon, the tool for modding creature, be adapted for a "standard" SoD ? It's possible, but I'll not do it. Boring and difficult. Beside, what's the point? You want standard SoD with MoP utility, install Era II then activate Safe SoD mod, you will have standard SoD but erm based, so Typhon will work. Indeed. It was missing dll. Fixed and editor running now.